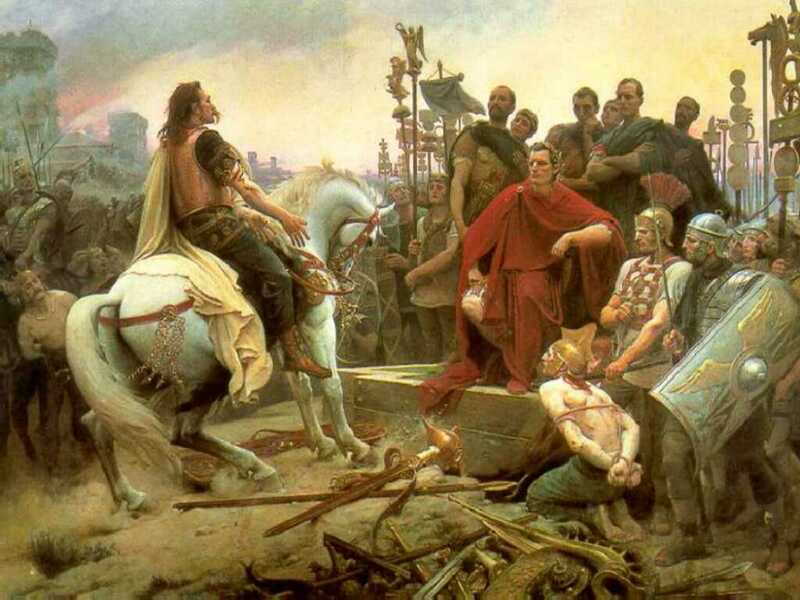 On this date in 52 BCE the head of the combined Gallic forces, Vercingetorix, surrendered to Julius Caesar following the siege and battle of Alesia, thus ending the Gallic wars and vastly extending the Roman Empire. Normally I do not like to celebrate wars in this blog and do so only if they are of major historical significance. This war, like all others, took countless lives and exhibited barbaric cruelty. In that respect there is nothing to celebrate. So I will mark the date rather than celebrate it. 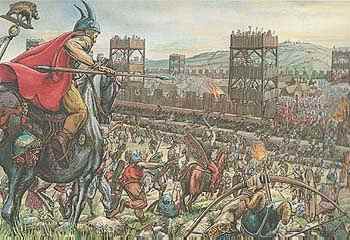 The Battle of Alesia or Siege of Alesia took place in September/October 52 BCE around the Gallic oppidum of Alesia, a major town and hill fort of the Mandubii tribe. It was fought by an army of the Roman Republic commanded by Julius Caesar, aided by cavalry commanders Mark Antony, Titus Labienus and Gaius Trebonius, against a confederation of Gallic tribes united under the leadership of Vercingetorix of the Arverni. It was the last major engagement between Gauls and Romans, marking the turning point of the Gallic Wars in favor of Rome. 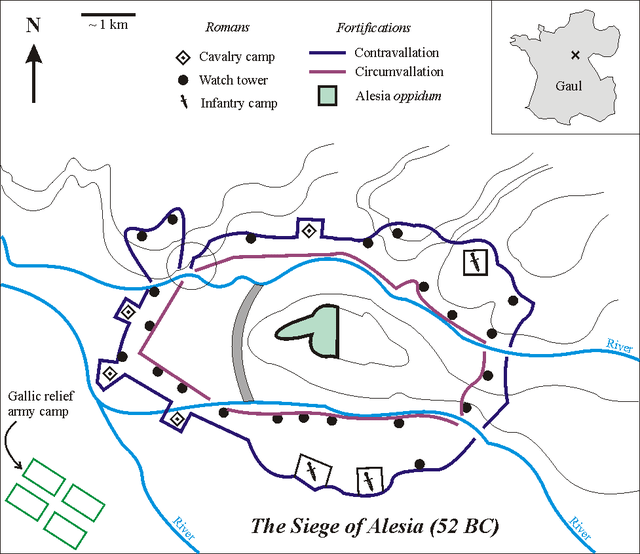 The Siege of Alesia is considered one of Caesar’s greatest military achievements and a classic example of siege warfare and investment (surrounding a location with fortifications). The battle of Alesia can safely be described as marking the end of Celtic dominance in France, Belgium, Switzerland and Northern Italy. The battle site was probably atop Mont Auxois, above modern Alise-Sainte-Reine in France, but this location, some have argued, does not fit Caesar’s description of the battle. A number of alternatives have been proposed over time, among which only Chaux-des-Crotenay (in Jura in modern France) remains a challenger today. At one point in the battle the Romans were outnumbered by the Gauls by four to one. The event is described by several contemporary authors, including Caesar himself in his Commentarii de Bello Gallico. After the Roman victory, Gaul (very roughly modern France) was subdued and became a Roman province. The refusal of the Roman senate to allow Caesar the honor of a triumph for his victory in the Gallic Wars eventually led, in part, to the Roman Civil War of 49–45 BCE which gave Caesar absolute power in Rome. This, in turn, led to his assassination which paved the way for Augustus, his adopted son, to become emperor. Following on from this was a massive expansion of the empire which was to last nearly 500 years. So, there was a domino effect that reverberated throughout Europe, and parts of Asia, beginning with victory for Caesar at Alesia. Julius Caesar had been in Gaul since 58 BCE. At the end of their consular year it was customary for consuls, Rome’s highest elected officials, to be appointed proconsul by the Roman Senate and assume governorship of one of Rome’s provinces. Following his first consulship in 59 BCE, Caesar engineered his own appointment of Cisalpine Gaul (the region between the Alps, the Apennines and the Adriatic – modern-day Northern Italy), and Transalpine Gaul (“Gaul beyond the Alps” – modern-day Switzerland and Alpine France). Although the proconsular term of office is normally one year, Caesar was able to secure his post in Gaul for an unprecedented ten years. With a proconsular Imperium, he had absolute authority within these provinces and had defeated through an initially unsuccessful campaign, the Celtic tribes of Northern Italy (Insubres, Boii, Taurini, Venetii). One by one Caesar defeated Gallic (Continental Celts) tribes such as the Helvetii, the Belgae, and the Nervii, and secured a pledge of alliance from many others. The ongoing success of the Gallic Wars brought an enormous amount of wealth to the Republic in spoils of war and in new lands to tax. Caesar himself became very rich since, as general, he benefited from the sale of war prisoners. But success and fame also brought enemies. The First Triumvirate, a political (although informal) alliance with Pompey and Crassus, came to an end in 54 BCE, with the deaths of Julia (Caesar’s daughter and Pompey’s wife) in childbirth and Crassus in the battle of Carrhae. Without this political connexion with Pompey, men dedicated to the Republic like Cato the Younger started a political campaign against Caesar, arousing suspicion and accusing him of wanting to overthrow the Republic and become King of Rome. In the winter of 54–53 BCE, the previously pacified Eburones, commanded by Ambiorix, rebelled against the Roman occupation and destroyed the Fourteenth legion under the command of Quintus Titurius Sabinus in a carefully planned ambush. This was a major blow to Caesar’s strategy for Gaul, since he had now lost about a quarter of his troops, and the political situation in Rome deprived him of receiving reinforcements. The Eburone rebellion was the first clear Roman defeat in Gaul and inspired widespread national sentiments and revolution. It took almost a year, but Caesar managed to regain control of Gaul and pacify the tribes. However, the unrest in Gaul was not over. The Gallic tribes had realized that only united could they achieve independence from Rome. A general council was summoned at Bibracte through initiative of the Aedui, once Caesar’s loyal supporters. Only the Remi and the Lingones preferred to keep their alliance with Rome. The council declared Vercingetorix, of the Arverni, commander of the united Gallic armies. Caesar was then camped for the winter in Cisalpine Gaul, unaware of the alliance made against him. The first sign of trouble came from the Carnutes who killed all Roman settlers in the city of Cenabum (modern Orléans). This outbreak of violence was followed by the slaughtering of all Roman citizens, merchants and settlers in the major Gallic cities. On hearing this news, Caesar rallied his army in haste and crossed the Alps, still buried in snow, into central Gaul. This was accomplished in record time and Caesar was able to surprise the Gallic tribes. He split his forces, sending four legions with Titus Labienus to fight the Senones and the Parisii in the North while Caesar himself set out in pursuit of Vercingetorix with six legions and his allied Germanic cavalry. The two armies met at the hill fort of Gergovia, where Vercingetorix held a strong defensive position. Caesar was forced to retreat to avoid utter defeat, after suffering heavy losses. In the summer of 52 BCE, several engagements were fought between cavalries, with Caesar succeeding in scattering the Gallic army. Vercingetorix decided that the timing was not right to engage in a major pitched battle and regrouped in the Mandubii fort of Alesia. Alesia was a hill-top fort surrounded by river valleys, with strong defensive features. As a frontal assault would have been hopeless, Caesar decided upon a siege, hoping to force surrender by starvation. Considering that about 80,000 men were garrisoned in Alesia, together with the local civilian population, this would not have taken long. To guarantee a perfect blockade, Caesar ordered the construction of an encircling set of fortifications, called a circumvallation, around Alesia. The details of this engineering work are known from Caesar’s Commentaries. About 18 kilometers of 4 meter high fortifications were constructed in about three weeks. This line was followed inwards by two four-and-a-half meter wide ditches, also four-and-a-half meters deep. The one nearest to the fortification was filled with water from the surrounding rivers. These fortifications were supplemented with mantraps and deep holes in front of the ditches, and regularly spaced watch towers equipped with Roman artillery. Vercingetorix’s cavalry often raided the construction works attempting to prevent full enclosure. The Roman auxiliary cavalry kept the raiders at bay, however. After about two weeks of work, a detachment of Gallic cavalry managed to escape through an unfinished section. 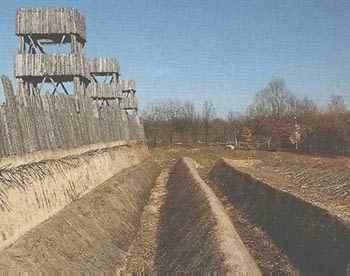 Anticipating that a relief force would now be sent, Caesar ordered the construction of a second line of fortifications, the contravallation, facing outward and encircling his army between it and the first set of walls. The second line was identical to the first in design and extended for 21 kilometers, including four cavalry camps. This set of fortifications would protect the Roman army when the relief Gallic forces arrived: they were now besiegers and preparing to be besieged. At this time, the living conditions in Alesia were worsening. With 80,000 soldiers and the local population, too many people were crowded inside the plateau competing for too little food. The Mandubii decided to expel the women and children from the citadel, hoping to save food for the fighters and hoping that Caesar would open a breach to let them go. This would also be an opportunity for breaching the Roman lines. But Caesar issued orders that nothing should be done for these civilians and the women and children were left to starve in the no man’s land between the city walls and the circumvallation. The cruel fate of their kin added to the general loss of morale inside the walls. 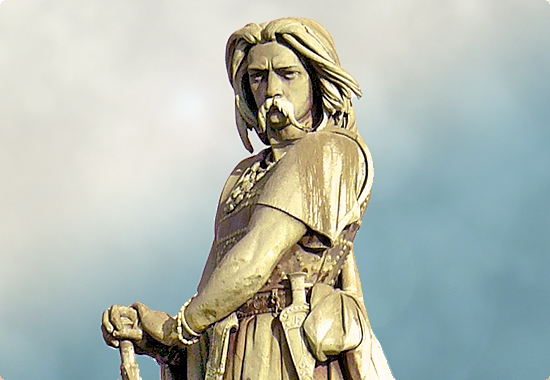 Vercingetorix was fighting to keep spirits high, but faced the threat of surrender by some of his men. However, the relief force arrived in this desperate hour, strengthening the resolve of the besieged to resist and fight another day. At the end of September the Gauls, commanded by Commius, attempted to break in by attacking Caesar’s contravallation wall. Vercingetorix ordered a simultaneous attack from the inside. None of the attempts were successful and by sunset the fighting had ended. On the next day, the Gallic attack was under the cover of night. This time they met with greater success and Caesar was forced to abandon some sections of his fortification lines. Only the swift response of the cavalry commanded by Antony and Gaius Trebonius saved the situation. The inner wall was also attacked, but the presence of trenches, which Vercingetorix’s men had to fill, delayed them enough to prevent surprise. By this time, the condition of the Roman army was also weak. Themselves besieged, food had started to be rationed and the men were near physical exhaustion. On the next day, October 2, Vercassivellaunus, a cousin of Vercingetorix, launched a massive attack with 60,000 men, focusing on a weakness in the Roman fortifications (the circle in the figure) which Caesar had tried to hide, but had been discovered by the Gauls. The area in question was a zone with natural obstructions where a continuous wall could not be constructed. The attack was made in combination with Vercingetorix’s forces who pressed from every angle of the inner fortification. Caesar trusted the discipline and courage of his men and sent out orders to simply hold the lines. He personally rode throughout the perimeter cheering his legionaries. Labienus’ cavalry was sent to support the defense of the area where the fortification breach was located. With pressure increasing, Caesar was forced to counter-attack the inner offensive and managed to push back Vercingetorix’s men. By this time the section held by Labienus was on the verge of collapse. Caesar decided on a desperate measure and took 13 cavalry cohorts (about 6,000 men) to attack the relief army of 60,000 from the rear. This action surprised both attackers and defenders. Seeing their leader undergoing such risk, Labienus’ men redoubled their efforts and the Gauls soon panicked and tried to retreat. As in other examples of ancient warfare, the disarrayed retreating army was easy prey for the disciplined Roman pursuit. The retreating Gauls were slaughtered, and Caesar in his Commentaries remarks that only the pure exhaustion of his men saved the Gauls from complete annihilation. In Alesia, Vercingetorix witnessed the defeat of his relief force. Facing both starvation and low morale, he was forced to surrender without a final fight. On the next day, the Gallic leader presented his arms to Julius Caesar, putting an end to the siege of Alesia. Alesia proved to be the end of generalized and organized resistance to the Roman invasion of Gaul, marking the definitive conquest of the Continental Celtic people by the Roman Republic. After Alesia, Continental Gaul was subdued, becoming a Roman province and was eventually subdivided into several smaller administrative divisions. Not until the third century would another independence movement occur. The garrison of Alesia was taken prisoner as well as the survivors of the relief army. They were either sold into slavery or given as booty to Caesar’s legionaries, except for the members of the Aedui and Arverni tribes, which were released and pardoned to secure the alliance of these important tribes to Rome. For Caesar, Alesia was an enormous personal success, both militarily and politically. The senate, manipulated by Cato and Pompey, declared 20 days of thanksgiving for this victory, but refused Caesar the honor of celebrating a triumphal parade, the peak of any general’s career. Political tension increased, and two years later, in 50 BCE, Caesar crossed the Rubicon, which precipitated the Roman civil war of 49–45 BCE, which he won. After having been elected consul, for each of the years of the war, and appointed to several temporary dictatorships, he was finally made dictator perpetuus (dictator for life), by the Roman Senate in 44 BC. His ever increasing personal power and honors undermined the tradition-bound republican foundations of Rome, and led to the end of the Roman Republic and the beginning of the Roman Empire. Caesar’s cavalry commanders followed different paths. Labienus sided with the Optimates, the conservative aristocratic faction in the civil war, and was killed at the Battle of Munda in 45 BC. Trebonius, one of Caesar’s most trusted lieutenants, was appointed consul, by Caesar, in 45 BC, and was one of the senators involved in Caesar’s assassination on the Ides of March (March 15) 44 BC. He was himself murdered a year later. Antony continued to be a faithful supporter of Caesar. He was made Caesar’s second in command, as Master of the Horse, and was left in charge in Italy during much of the civil war. In 44 BC he was elected as Caesar’s consular colleague. After Caesar’s murder, Antony pursued Caesar’s assassins and vied for supreme power with Octavian (later to become Caesar Augustus), first forming an alliance with Octavian (and Marcus Aemilius Lepidus) in the Second Triumvirate, then being defeated by him at the Battle of Actium in 31 BC. Along with his ally and lover queen Cleopatra, he fled to Egypt, where they committed suicide the following year. Vercingetorix was taken prisoner and languished in prison for the next five years while waiting to be exhibited at Caesar’s triumph. As was traditional for such captured and paraded enemy leaders, at the end of the triumphal procession, he was taken to the Tullianum (also known as the Mamertine Prison) where he was said to have been strangled, although he was most likely executed in a Roman dungeon. I have chosen wild boar stew as the recipe of the day because it is well documented as a Gallic/Celtic favorite. Mostly I remember it from the French cartoon Asterix that parodies the resistance of the Gauls and is a longstanding favorite of mine. There are many modern recipes for the stew but this one aims to be a rough replica of ancient recipes. The original calls for browning the meat and vegetables which I think would have been unlikely in ancient times. The day before cooking, marinate the meat in the ale, juniper berries and herbs by placing them all in a large ziplock bag sealing the top except for a small hole, expelling all the air and then closing completely. Refrigerate overnight. Empty the meat and marinade into a large pot. Add the honey add pearl barley, bring to a boil, and then reduce to a slow simmer. Skim the surface until it is reasonably clear. Cover and simmer for 2 ½ to 3 hours, or until the meat is tender. By this point the barley starch should have thickened the sauce. In fact you may need to add water along the way if it becomes too thick during the cooking process. Serve piping hot in bowls with hunks of crusty bread.